Petey is the first dog to live in a dorm on the USFSP campus. He’s learning how to be a guide dog. ST. PETERSBURG – The University of South Florida St. Petersburg has welcomed a non-traditional student into one residence hall. With four legs, lots of fur, and no textbooks, Petey is a new student at USFSP, but he has no intention of getting a bachelor’s degree. The guide-dog-in-training has joined his raiser Stephanie Campos, a 22-year-old USFSP senior, in her on-campus dorm room. Petey is a 4-month-old yellow Labrador retriever with a calm demeanor. His long-term goal is to become a guide dog, and short-term goals are to learn the dog-manners of the world: sit, stay, heel. 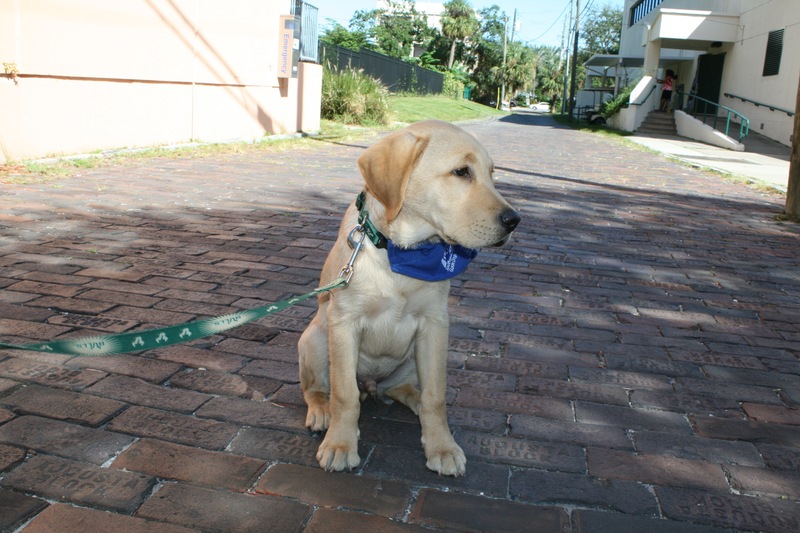 Petey found his way to USFSP by means of Southeastern Guide Dogs, which is based in Palmetto. Southeastern Guide Dogs works to transform the lives of the visually impaired and veterans with disabilities by giving them hope, confidence, and independence through the assistance of a guide dog. Kathy Saunders works as Southeastern’s area coordinator for Southwest Pinellas. While attending USFSP’s food writing and photography graduate certificate program in 2016, she was inspired to set up a booth at the annual Get on Board day on campus. Get on Board is a day for students to check out what clubs the campus offers and get involved in the community. With more than 100 students signing up for the Puppy Club, Saunders soon had her hands full with students eager to devote their time to puppies. Last fall, Saunders hosted training sessions for students interested in becoming puppy raisers and sitters. The training sessions consisted of teaching students the laws around guide dog and service dogs, as well as handling and puppy training methods. Eventually, the students became puppy sitters for local puppy raisers. Puppy raisers would stop by and drop off their pups for a few hours and students would socialize them or take them to class as a chance to give the raisers some time to run errands or attend meetings. The puppies add a fun element to the routine schedules students maintain, and are also exposed to settings that enhance their training. Between campus activities, a crowded dining hall and class schedules that entail sitting still for at least an hour and fifteen minutes, the puppies are introduced to many new experiences. “The university is a great place for that because there are all kinds of exposures,” Saunders said. Students typically worked in teams and were able to log community service hours for the time they spent as puppy sitters. Southeastern Guide Dogs gets the puppies when they are about 9-12 weeks old. They are then placed with a raiser for 14-16 months. “We are not trainers, we are raisers. We are helping them become guide dogs and giving them a good foundation for the trainers when they go back to campus,” said Saunders. When they are old enough, they go to Guide Dog University where they are assigned their own kennel in the “freshman dorm” on campus. The dogs remain at Guide Dog University until they are placed in their forever homes. Saunders estimates 30 percent of the puppies become guide dogs. The 70 percent that don’t make it go to a variety of places including Southeastern’s Veteran Service Dog program that helps veterans deal with PTSD, which differs from the guide dog program. Guide dogs are placed with people who are physically dependent on a guide for day to day activities. Service dogs are placed with people who are physically capable but still require or benefit from assistance. Puppies who don’t graduate from Guide Dog University are also be placed with the Florida Fish and Wildlife Conservation Commission, train with the Maine bomb and arson detection program, or become companions of blind children. If a dog is determined to be unable to work or has medical issues it is put up for public adoption. The Puppy Club is how Campos was assigned Petey. Having never owned a dog before, Campos attended Sunday training sessions at Saunders’ home and will continue to accompany Petey to “kindergarten” courses weekly for a month before he can accompany Campos to her classes at USFSP. 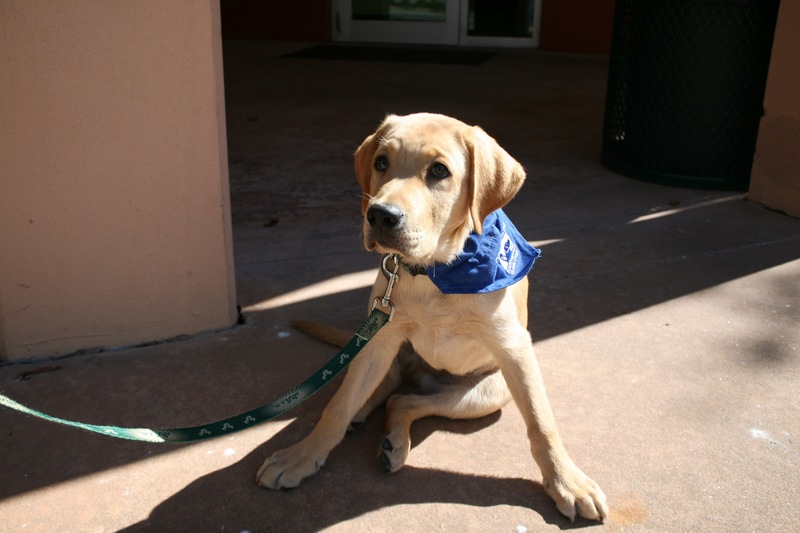 Petey is one of seven guide dog trainees to be placed with a raiser on the USFSP campus, but is the first guide dog to actually live on campus. The other puppies live off campus but travel to USFSP with their raisers who work at or attend the college. The club anticipates two more off campus raisers by the end of the year. For information about Southeastern Guide Dogs, or to become a raiser, go to guidedogs.org. Petey is the first dog to live in a dorm on the USFSP campus. He's learning how to be a guide dog.